For nearly nine years, scientists inside the boxy brick Western Connecticut Health Network Research Center have been working to develop a more accurate test to diagnose the scourge of the Connecticut woods: Lyme disease. Lyme disease is carried by the tiny blacklegged tick, commonly known as a deer tick. When a blacklegged tick infected with Lyme bites a human, it can transmit a tiny microscopic organism, called a spirochete, that moves around the human body, evading easy detection. 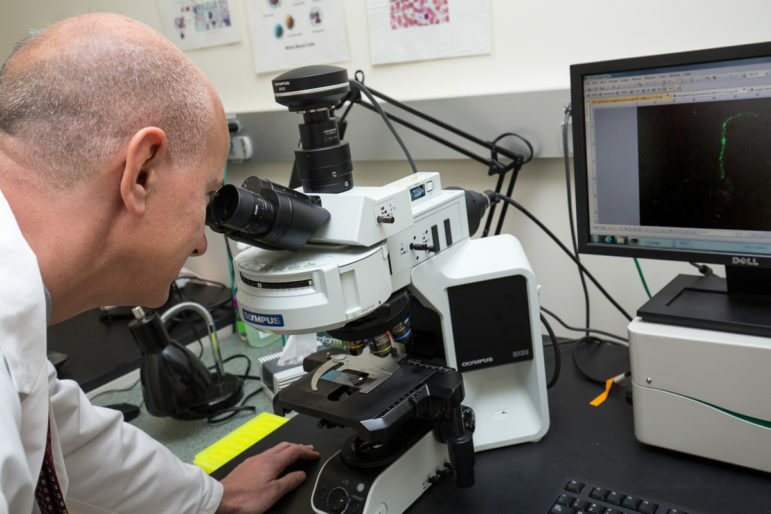 Dr. Paul Fiedler, chair of pathology and laboratory medicine at WCHN, looks through a microscope as a spirochete is displayed on a monitor. Researchers in Danbury have been trying to detect that spirochete, similar to those that cause syphilis and other diseases, in people’s blood. Pathology research scientist Donna Guralski powered up her microscope and computer recently to show the culprit: a fluorescent green corkscrew-shaped organism that twisted around the screen, just as it would burrow through a person’s blood vessel walls and into tissue. But scientists have learned that they can’t view the spirochete in fresh blood samples. “We gave up on this method,” Guralski said. About 300,000 Lyme cases have been reported nationally from 2006-2016, and an estimated 3,000 cases are reported in Connecticut yearly, according to the Centers for Disease Control and Prevention (CDC). In 2015 9.5 percent of all confirmed Lyme cases were reported in 14 states including Connecticut, Vermont, Rhode Island and New Hampshire. But the CDC says that Lyme disease is 10 times as common as the number of cases confirmed each year. But the CDC says that Lyme disease is 10 times as common as the number of cases confirmed each year. Part of the reason for the explosion in Lyme cases is the changing climate. Warmer falls and earlier springs have helped spread Lyme disease, the U.S. Environmental Protection Agency (EPA) determined four years ago. Tick eggs lie dormant through cold weather, and adult ticks are very clever at surviving under buried leaves, in basements and sheds. “People say, ‘We’ve had a really bad winter; there was a lot of snow’,” said Kirby Stafford III, state entomologist at the Connecticut Agricultural Experiment Station. “I say the ticks are doing just fine. Snow is an insulator.” One of his researchers discovered that winters with more snow and rain lead to summers with more ticks, he said. And Lyme ticks aren’t the only ones thriving these days. The mostly southern lone star tick showed up in Connecticut last year on a deer found dead near Norwalk. Two of the most crucial carriers of the disease are white-footed mice and chipmunks. Those animals thrive in forested suburban landscapes, and they’re responsible for infecting the nymph (baby) ticks every spring, starting the whole cycle again. Lyme disease isn’t easily diagnosed. If a person isn’t producing antibodies just as blood is drawn and analyzed, the test result is often negative. Only about one in 10 cases can be confirmed using diagnostic tests, leaving the rest to guesswork by doctors, according to a 2012 analysis of the failed Lyme vaccine trials of the 1990s by Robert A. Aronowitz in the Milbank Quarterly. “Only a small fraction of initially suspected cases were confirmed as definite Lyme disease (in the 10 percent to 20 percent range), suggesting widespread overdiagnosis (or alternately, that the diagnostic criteria were too narrow),” according to Aronowitz. 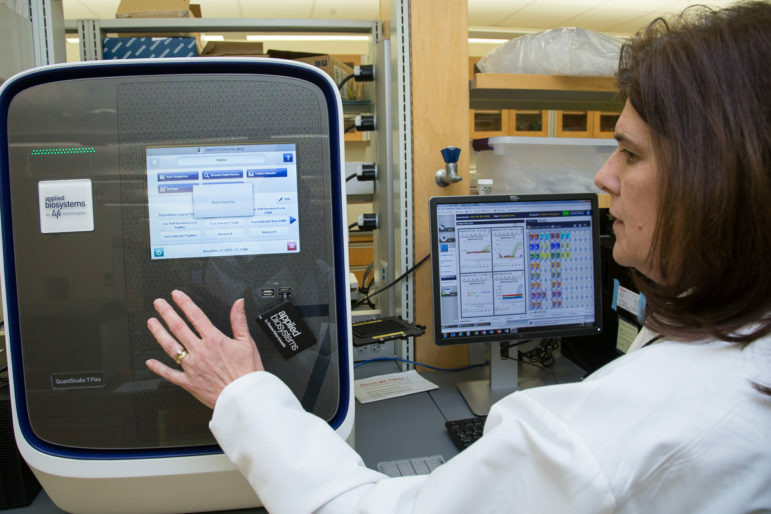 Donna Guralski, WCHN scientist, demonstrates the procedure for the quantitative PCR test for detecting Lyme. The difficulty in diagnosing Lyme has left possibly thousands of Connecticut patients suffering myriad painful symptoms, including flu-like aches, arthritis, Bell’s palsy and headaches. Suffering with undiagnosed Lyme disease “changed my life,” said Kimberly Ruggiero of Madison, who finally received antibiotics after three years of joint pain, excruciating headaches and confusion, before a lab test confirmed she had Lyme disease. The disease, named after the town of Lyme in Connecticut, is the most common vector-borne disease in America. It was discovered in the late 1970s when 51 people, mostly children who lived in or near Lyme, all suffered similar arthritis-like symptoms. Willy Burgdorfer, a medical entomologist, verified the connection to the blacklegged tick and identified the spirochete in 1982. But the signs and symptoms of Lyme disease are often nonspecific, appear in stages and can be linked to other conditions, making it difficult to diagnose, according to the Mayo Clinic. Early signs include a rash in the form of a bull’s-eye and flu-like symptoms, such as fever, chills and body aches. No test was needed when Deborah Livingston of Bolton took her son, Shep, to a pediatrician as soon as he developed a circular dark-pink rash under his arm. “When the pediatrician saw the rash, she knew right away,” Livingston said. Annie Atwood of New Haven said that in 2008 her then 4-year-old son, Roddy, was complaining of ankle pain, and within a few weeks lay on his side, moaning. “The next morning, he couldn’t even walk,” Atwood said. A test confirmed Lyme disease and he was cured after several weeks of antibiotics. Antibiotics, such as doxycycline, are often prescribed, but there is no official consensus on how long treatment should last. Right now, the diagnostic and treatment criteria, last updated in 2006, are under review by the Infectious Diseases Society, the American Academy of Neurology, the American College of Rheumatology, and other collaborators. At the Danbury lab, researchers have tested various methods in search of the best diagnostic tool. Blood and urine are stored for testing. The PCR test is so sensitive that it would be too expensive to use widely, said Dr. Paul Fiedler, chairman of the lab’s pathology research group. He said a simpler test known as QPCR (quantitative PCR) also works at the molecular level, looks for the Lyme spirochete’s genes, and divides each patient sample into 96 segments. Das used graphs showing rising colored lines that revealed Lyme, and other graphs showing no rising lines, or no disease. He said someday soon this test might become a standard to diagnose the rising number of Lyme cases. The lab hopes to develop one test that detects three of the diseases carried by the blacklegged tick: Lyme disease, anaplasmosis, and babesiosis. The tick also carries Powassan virus, another serious illness. The scientists’ challenge is that the Lyme spirochete does not remain in the blood, as other tick-borne organisms do. Lyme spirochetes hide from detection. They can curl up into a ring and break up into blobs to survive. They don’t stay in red or white blood cells, as some other tick-borne bacteria do. They move around, pushing through blood cells and into tissue, scientists explained. 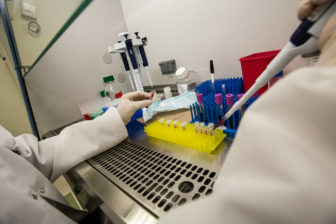 A prime supplier of blood samples for study is the Western Connecticut Health Network’s Lyme disease biobank. Joann Petrini, director of the bank, said the bank begins signing up patients for study as early as March. The biobank is currently looking for new study participants. To participate, subjects must be at least 5 years old and have been diagnosed by a doctor as having Lyme disease. Participants donate both blood and urine for research studies. Some of the samples are studied right away, and others are labeled and frozen. To donate to the biobank, call 203-739-8383. Description of the current CDC protocol for two-stage testing.